Then I had to grow up and get a real job. Do you remember your first job? How much you were paid? I don’t have the first dollar I ever earned or my first paycheck, but I still have scraps of paper listing most if not all of the jobs I have had. And now I will publish it for the world to see. 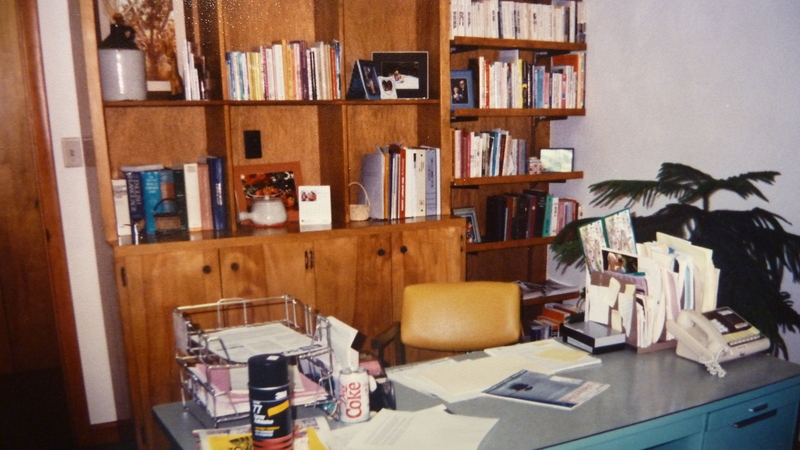 I have lots of memories (aided by notes) but very few pictures of me in a work setting–funny how that is and I bet I’m not alone. Like a lot of girls, my very first job was babysitting for neighbors, Jim and Christine, when I was 11 or 12. I was paid 35 cents an hour. Now I sound like I grew up in the Depression. Then I got to the age when I actually ran an ad in the paper saying I would do ironing, babysitting and cleaning. Ironing, really? Yes! I felt grown up, running and paying for my own ad which cost about $3.75. So that got me my first gig for someone I didn’t know, and earning 75 cents an hour babysitting and ironing. Over the years I also cleaned houses, scrubbed floors (and waxed them), painted, picked up pecans, pruned shrubbery, picked up corn in fields (my notes say to pay for homescoming dresses), and lots of odd jobs earning money for various youth groups trips and projects. By the time I moved to Florida my senior year of high school, one summer I earned $5 a day as a waitress for Carpenter’s Steak House (plus tips). Over other summers during college, I cleaned for the town judge and a dentist at $1.70 an hour, drafted blueprints for the mobile home factory my father was involved in for a few years ($1.80 an hour) and did clerical work for the Calhoun County School Board at $2.10 an hour. I worked about two months at a steak house at Panama City Beach (which I thought would be a dream job), earning 75 cents an hour plus tips, averaging about $10 a night. My most unusual jobs were tutoring a businessman in Spain at $2.50 an hour while studying abroad my junior year of college, scrubbing pots and pans for a cookware demonstrator, and altering sleeves on the clothing of a woman whose arm enlarged inexplicably after she had surgery for breast cancer. And oh yeah, I was also a camp counselor a couple weeks, and a short order cook in my college’s snack shop, and later a dishwasher in the college cafeteria. 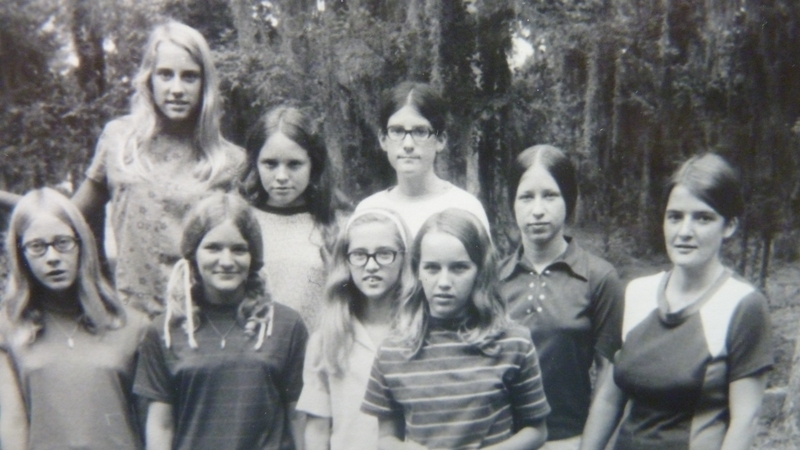 Counselor at Lakewood Retreat Mennonite Camp, Fla., me far right. Circa 1972. My worst job ever was working the night shift at a lumber mill in Florida. I was a “runner” for a huge plywood drying machine earning $2.05 an hour, which would have been ok, but there were no coffee or lunch breaks and when I asked about that my coworkers said you had to get fast enough to grab bathroom breaks or eat your lunch. After two nights, I decided there had to be a better job in town. There was, packing flannel shirts in bags at a sewing factory. I learned much from my coworkers as they talked about who was stepping out on whome, who was pregnant, who was getting a divorce. During a year of Mennonite voluntary service, I also taught nursery school (and discovered I didn’t want to be a teacher), and organized cooking and sewing classes for middle school girls. Mennonite Media Ministries, Media Ministries, Mennonite Media, Third Way Media, and now, MennoMedia. was housed in our building. 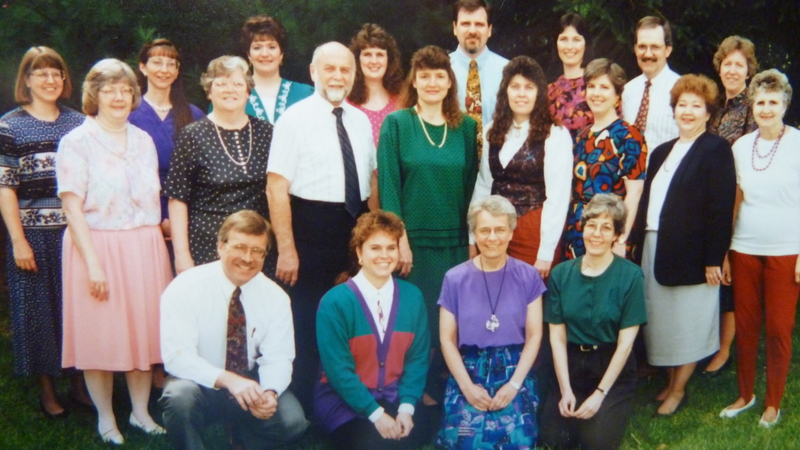 Circa 1995, I’m near the middle in a kelly green dress. as they did most new female staff members. Funky glasses. And you thought all I’ve done my whole life is just be a writer. Nearing 38 years here, I’m still with my first real full time employer (although the agency has gone through numerous name changes and one merger). I started as a secretary and had to take a typing test on an old electric typewriter. That was before the Depression. Ha. I remember my first training session on a computer, the first time I used a mouse and how foreign that felt, the first time I saw a FAX come in, the first time I got online. 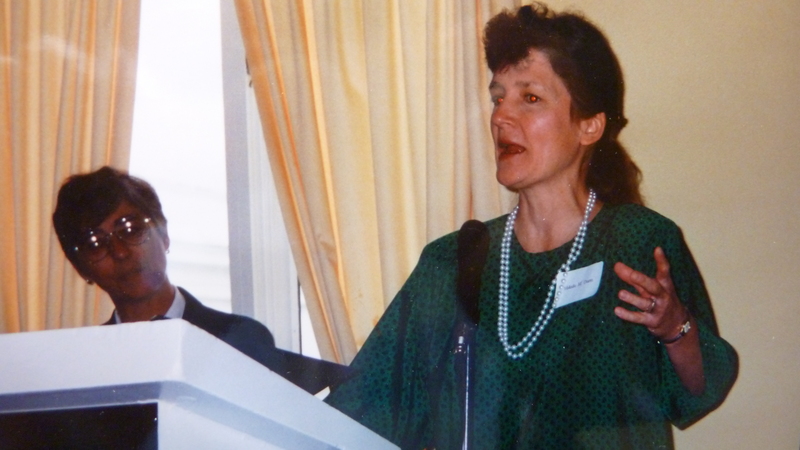 Giving a speech at an award banquet by Skyline Girls Scouts (still circa 1995 with those pearls and fav green dress). Finding harmony between work and personal life is a gift that not everyone gets or achieves. I know it is a rich blessing to not only have a job, but to enjoy my work. I try to be grateful every day. What was your favorite weird job you love to remember? Your worst job ever? Check also my editorial in the summer issue of the magazine I edit, Living, for a piece on kids and helping them get valuable work experience over summer. Did you forget gathering eggs for 2.5 cents per flat every day of our lives thru highschool? I was trying to delineate jobs away from home, versus the jobs we had at home. But yes, I did think about whether to include that!! And when I was looking for photo illustrations, the only pictures of people in job settings I could come up with were YOU–working in that pizza shop, running that golf cart: you’ve had quite a string of jobs too (not to mention quite a life.) We’ll do your book someday. 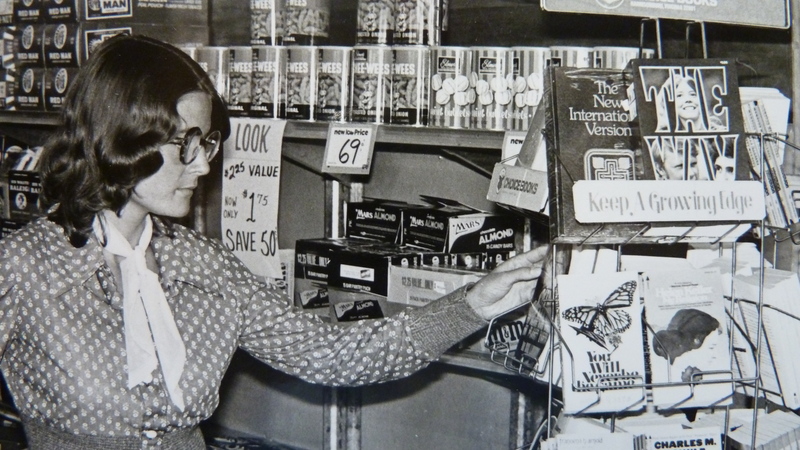 My first job was as a Drug Store Clerk, which also included being a “Soda Jerk.” It put me thru Goshen College, because I went home (Shipshewana, IN) every Saturday to work during College. Loved it, I guess. At least the money. Now, I’m an RN, BSN, MSeD, have been in Tanzania, Russia, Europe, Honduras. You reminded me of a job I had Saturday mornings during college, as the sole person running a little yarn shop–in a town that still had an awesome soda fountain at the drug store with 10 cent coffee. I loved that too. You have had quite the travel list too! Thanks for the comment.